Welcome to my blog! This is where I post about my rides – for other adventures, check out The Woodsy Ones. My wife and I are currently traveling while she takes travel nursing assignments. We’ll be in Virginia through July 2015. Thanks for reading, and feel free to leave comments too. Simply put, “coffee outside” is about a casual gathering to enjoy the morning over sips of coffee before the rest of the day’s pressures set in. Best enjoyed with friends old and new, it’s a great way to catch up with others or meet new people. This brief video is a great summary too. While bike commuting is often the preferred method, there’s no wrong way to enjoy a cup of joe on an island. Bike, walk, paddleboard, kayak, scoot, or row your way over! We’ll be meeting at Four Tree Island on July 20, but may try out other new locations on different weeks. The common setup is a camp stove, coffee beans, and some type of filter or press. There are many combinations and no wrong way to make coffee! If you don’t have that gear, feel free to bring a thermos from home or grab a cup from your favorite place on the way. Or just bring yourself and see who’s got extra to share. When did coffee outside start? What if I know nothing about coffee, bikes, or Portsmouth? No problem! We’d love to spread the knowledge. The secret about coffee outside is that it’s not really about the coffee. Errin Vasquez, who started the LA River Camp Coffee Connoisseurs once said, “An okay cup on the river with friends is better than a great cup at work.” It’s really just about a relaxing way to start the day! Who’s running this? I need more info. 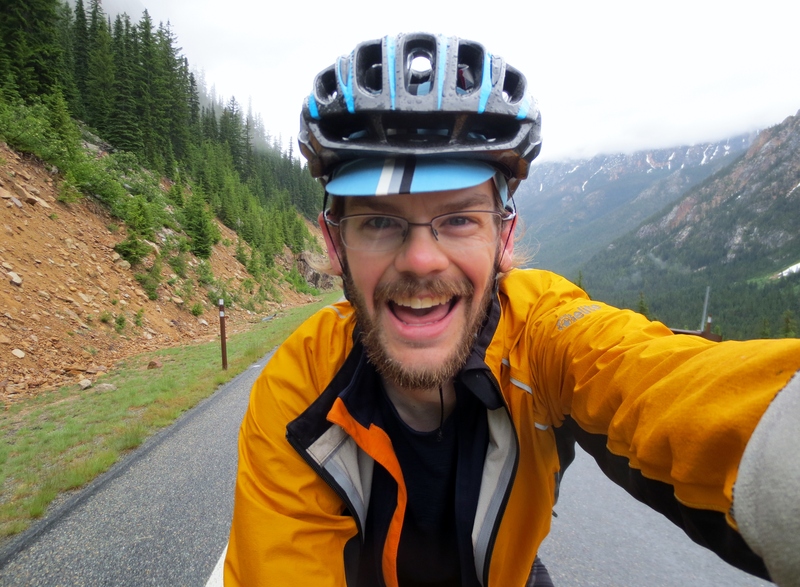 Andy moved to Dover a year ago, and bike commutes to Portsmouth often. He was previously traveling the country with his wife while she was taking three-month travel assignments, and enjoyed coffee outside events in many of those places. You can email him here if you need more info. Moving frequently means always being the new guy in the club. The fleche has always been my favorite type of randonneuring ride, but as it requires having a team of 3-5 bicycles, I had to be proactive about finding the right people to ride with. 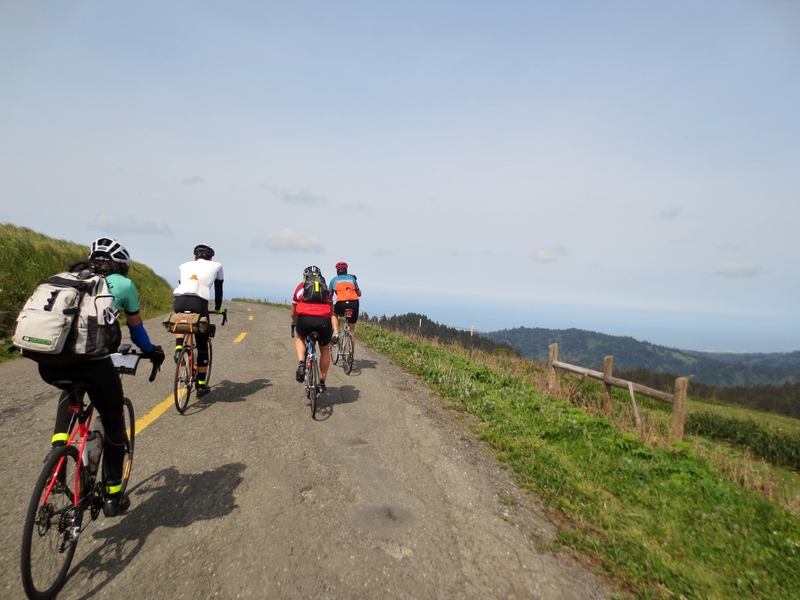 So at the start of an SFR ride, I mentioned the fleche to Eric and he told me about his idea to ride on the Lost Coast prior to the fleche. This sounded rather daunting to me, but it made sense that if we were driving that far north, we may as well keep going and ride among some even more beautiful scenery. He had ridden a similar route last year, so I felt that this was worth going for. On Thursday afternoon, we drove all the way up to Arcata. Luck had it that all the hotels were booked solid for some college parent thing, but we eventually found a place. Tim stayed somewhere nearby and joined us at the start on Friday morning. I think our start time was 8am, but we didn’t actually get rolling until half an hour later. 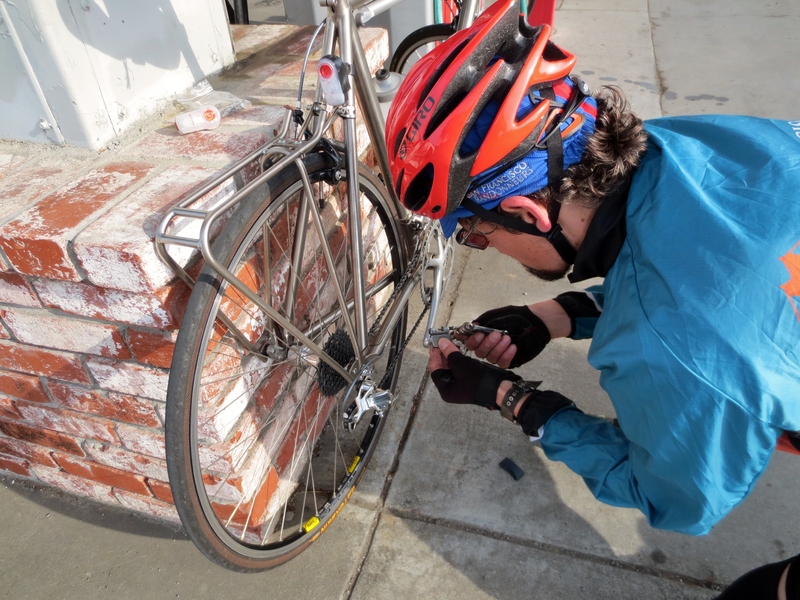 Eric had to stop after a few miles due to a chain issue, and he replaced a breaking link. Not far after Eureka, I looked back to see two riders wearing recognizable reflective vest colors, indicating that they were likely to be randonneurs. 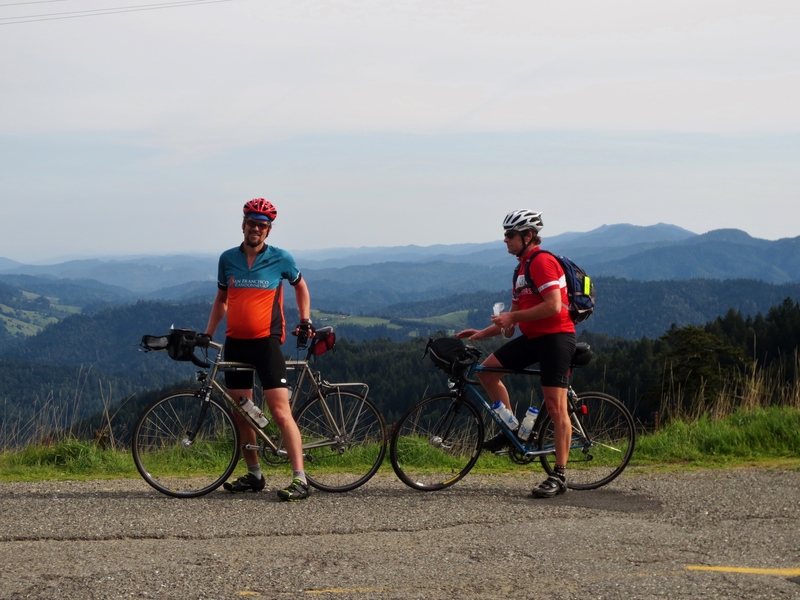 A minute later, Roy and Max caught up, and we learned about their similar plan to ride the Lost Coast (although on more dirt roads for a slightly shorter distance, not for RUSA credit). As the Google terrain map shows, the Petrolia sign is the end of flat ground for a long time. We ascended for quite a while, but kept a reasonable pace knowing that the day would be long, and only the beginning of our weekend adventure. The road was empty. There is literally nothing to get to out there, so there is no traffic. The road is also in poor condition, but it was easy to see far enough ahead to safely use the entire road to avoid holes when needed. We all stopped a few times for pictures, as it was just too gorgeous not to. We had three main stops – really at the only places there was to stop. I did just fine on two water bottles, but if it were a hot day this would be tougher with limited services. At the final store, Roy and Max headed for a dirt climb, despite the locals thinking they were nuts, saying things like “even we don’t drive up there” or “watch out for cars cutting every corner”. Our climb was still steep enough, and offered a grand view right at the 5 mile mark. The grade drops, but it’s still a climb past the view. The descent was scary – badly paved, twisty curves, although just a few cars. It was tough to let go, since a sudden bump was very jarring, and the switchbacks were requiring significant slowing. Once at the bottom, the road became flat and smoothly paved. We entered into the Avenue of the Giants. The road literally weaves through the forest, abutted with giant trees. I remember it being about 6:15pm, although it was mostly looking dark because of the canopy above – sunset would still be an hour away. Tim took a long pull, upping the pace to just the right level to make good time without taking from tomorrow’s reserves. We made it to Garberville after about 12 hours on the bike, making this the longest 200km I may ever do. The 10,000+ feet of climbing really eats up a lot of time. We met up with one additional teammate for the fleche (Ryan), and prepped bikes for the following day. A fresh set of clothes, and a box to mail home the dirty kits, were waiting for us at the hotel. I slept hard that night! Stay tuned for part 2 of the fleche weekend! I originally planned on a hilly 200km Permanent with Eric, but plans changed and he offered a ride to Santa Cruz for their 200km. The start was far too early, considering to get there for 6am, I had to leave around 4:30am. 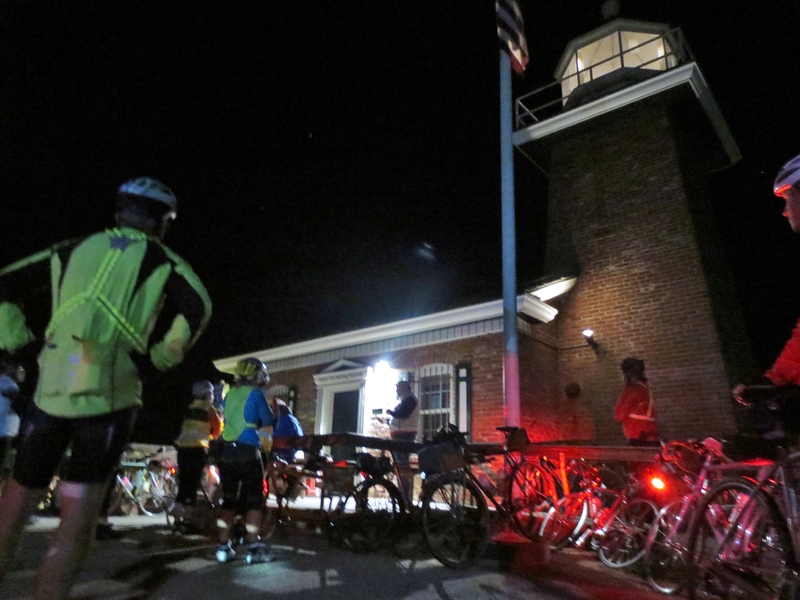 A pack of ~30 randos converged at the lighthouse for the start, and it remained dark for a while along the coast. At least we’d see it on the return trip. This route went north to Half Moon Bay (not very far from where I live) and returns, with a few side tracks into the hills. Eric was riding a fixed gear bike, and was leading the pack in the beginning. We got a very speedy start, though unfortunately one person ahead of us crashed hard on railroad tracks. The group fell apart here, but I stuck around some people I knew. Metin had brought a friend, and we stayed together for the rest of the day. Phil was nearby much of the time too, mostly riding just a tad slower but taking shorter stops, so we leapfrogged several times. The climbs were relaxing, and there was little traffic away from the major roads. 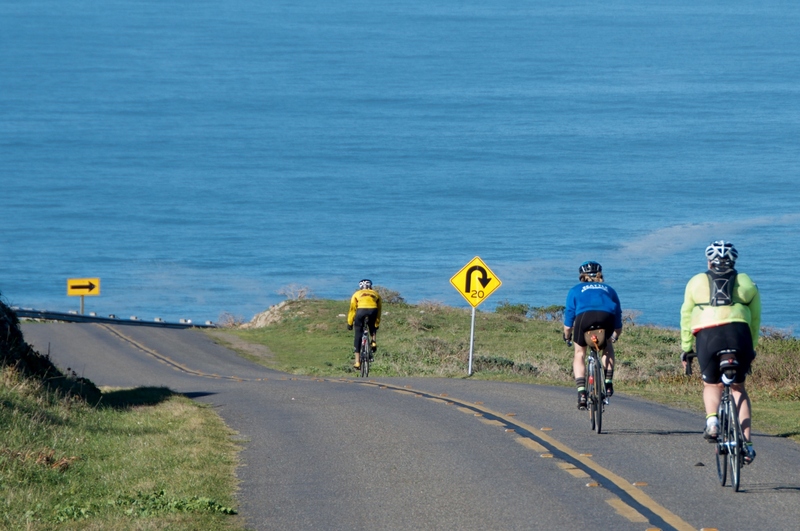 After turning around in Half Moon Bay, the climbs were more popular with midday riders. The weather was certainly great for a bike ride. 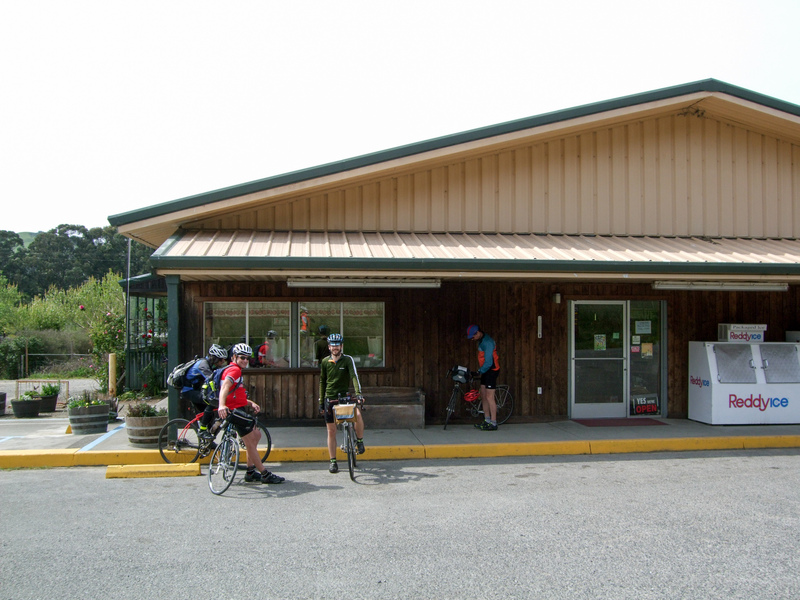 Being Pi Day (3/14), we opted to stop at a pie barn near the end, which had drinks and music for a small celebration. The last 20 miles flew by, and we got the the finish around my typical 9 hours. Eric rolled in soon after. Another SFR ride, another morning crossing the Golden Gate bridge. Once again, Metin was kind enough give me a ride to the early morning start. I recognize a few more randos at the start each time, which is reassuring on these long rides. In the beginning I rode alongside Eric, whom I met on the Cascade 1240 last year (and chased his wheel for two days). 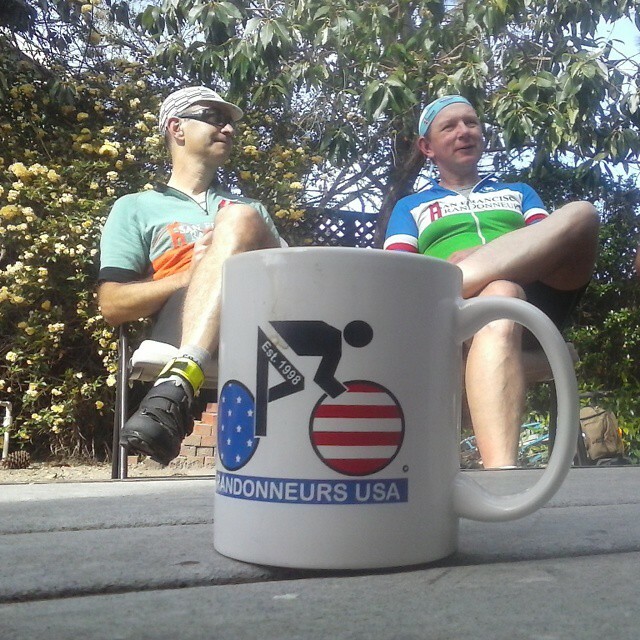 We got talking about his ambitious plans for this year’s fleche (more on that later). 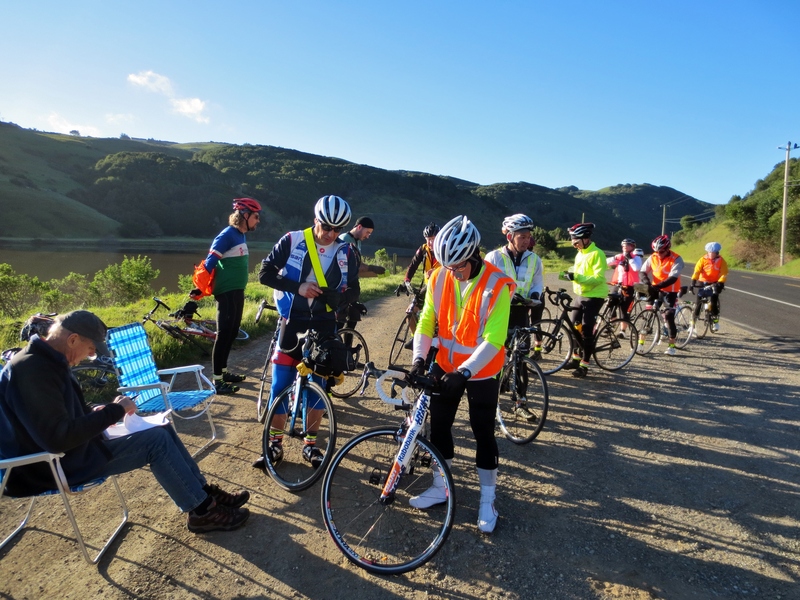 We had a group 20 strong or so, all the way to Petaluma on familiar roads. The next stretch was traffic and lights to Healdsburg which wasn’t ideal, but wasn’t awful either. Having a group helps me forget about some of the downsides of less interesting roads. I took a longer break than most in Healdsburg at the Subway, and continued on my own. After a few miles, I thought I should probably have the cue sheet out just to follow along so I don’t miss a turn, since I didn’t check the GPS accuracy at home. While I was stopped roadside, a few randos came by so I went off with them. One broke off, but Greg and I rode Russian River together at a reasonable pace. 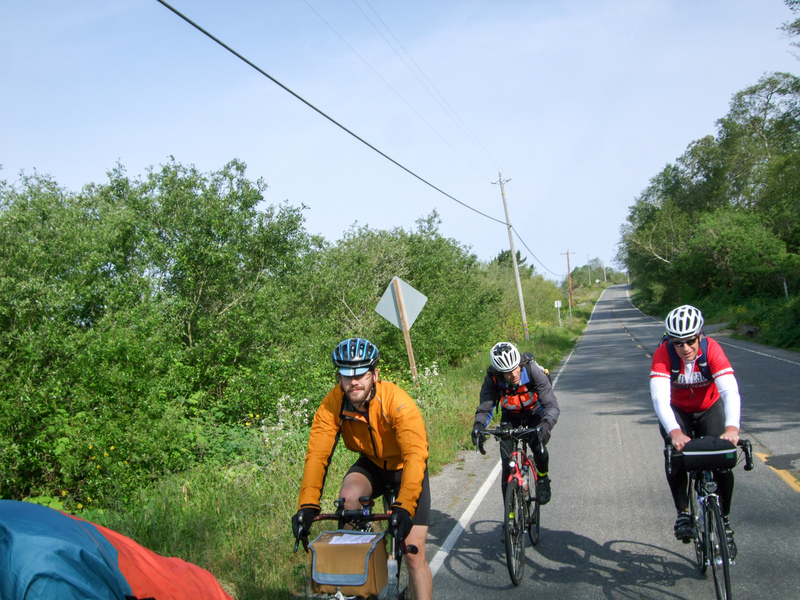 Somewhere before Bodega Bay, a few strong riders flew by, only to get a flat shortly after. I told Greg that I was going to kick up the pace when they fly by again, and that plan seemed to work well for a little while. 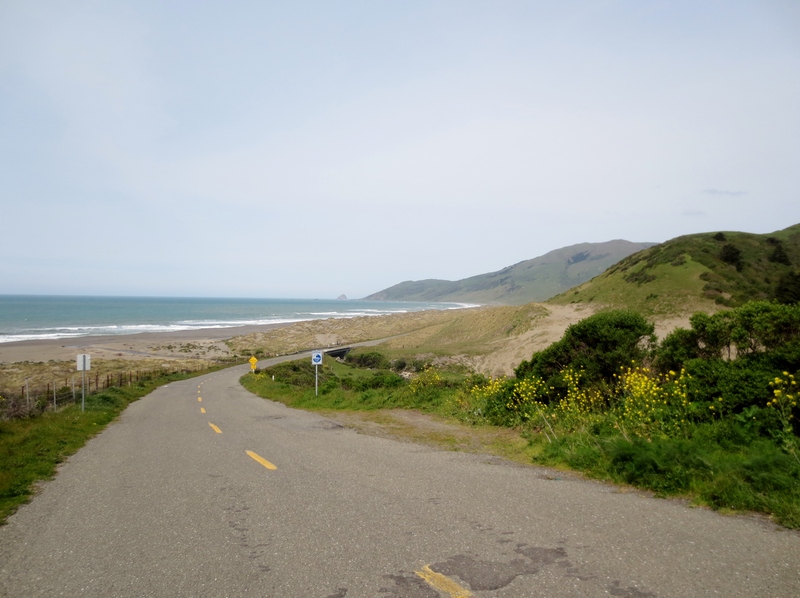 After a long stop in Bodega Bay, I was mostly riding with Carlin. We reached the Marshall Store to see several more randos chowing on seafood. For the rest of the ride, I felt okay, but in lower spirits for whatever reason. The forecasted rain never came thankfully. I had no trouble rolling along, but couldn’t keep a high pace on my own. I knew that my chances of getting a ride home were getting slimmer, but fortunately Metin was still hanging around when I rolled in. I was happy with my overall time, about an hour slower than my last 300km which was in a fast paceline all day. Only two weeks into my rando career of 2015 and I got my second 200km ride done! Despite the general forecast of the week being dreary between major storm systems, the weather turned out as fantastic as I could have asked for. Others weren’t so confident in the day though, and turnout was very low. I’m figuring that in rainy places (PNW especially), randonneurs are prepared for the worst and still come to rides with predictions of rain. California being generally sunny and fenderless meant few risk takers, but they missed out on this ride! 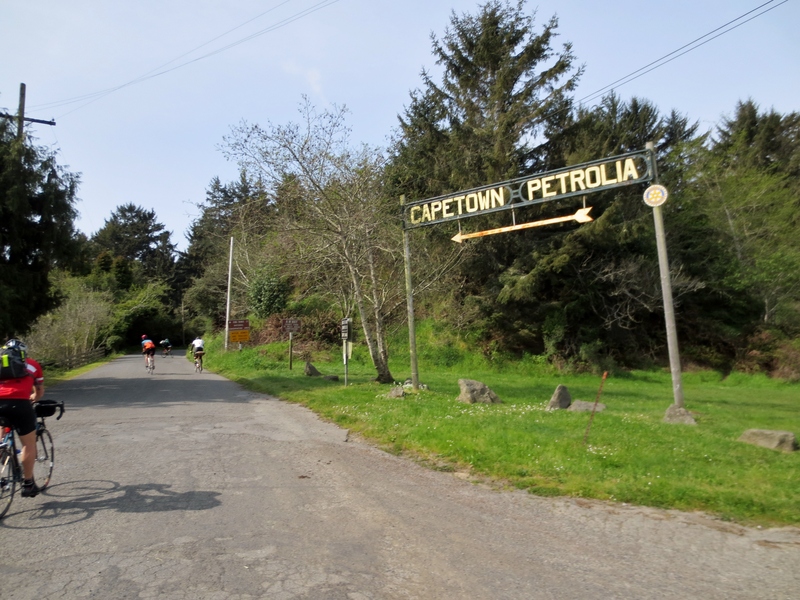 The route started similar to the last – over the big red bridge, through some rolling terrain, and eventually making a turn into new territory in Sonoma County. My jacket only lasted for the first hour, until it started to get warmer out. Just past the a high point where I stashed it, I was riding over nasty shoulder debris and got a glass shard in my Compass tire. I was nearly at the front when this happened, and watched as most of the crowd passed by. I went with a tube change rather than a patch job just in case, and later clocked the time at 10.5 minutes stopped, which isn’t too bad for a flat in my experience. I engaged Cat 6 racing mode, and would catch someone to briefly hold their wheel before launching ahead again. A few people seemed surprised and uncomfortable with someone behind them, so I kept moving along. I was soon back up to pace and didn’t need to push my luck trying to go fast. 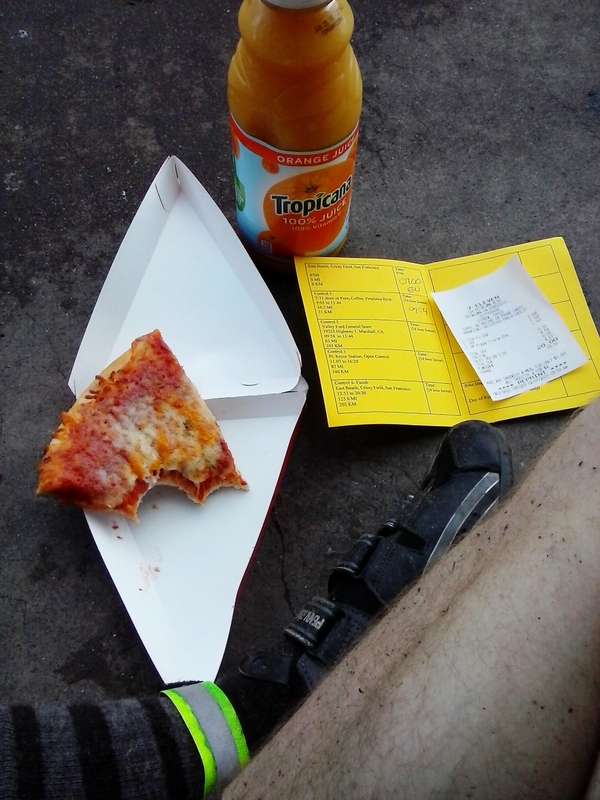 The first controle came soon enough, and I got pizza and OJ to keep my sugar high enough to avoid relying on Clif Bars. 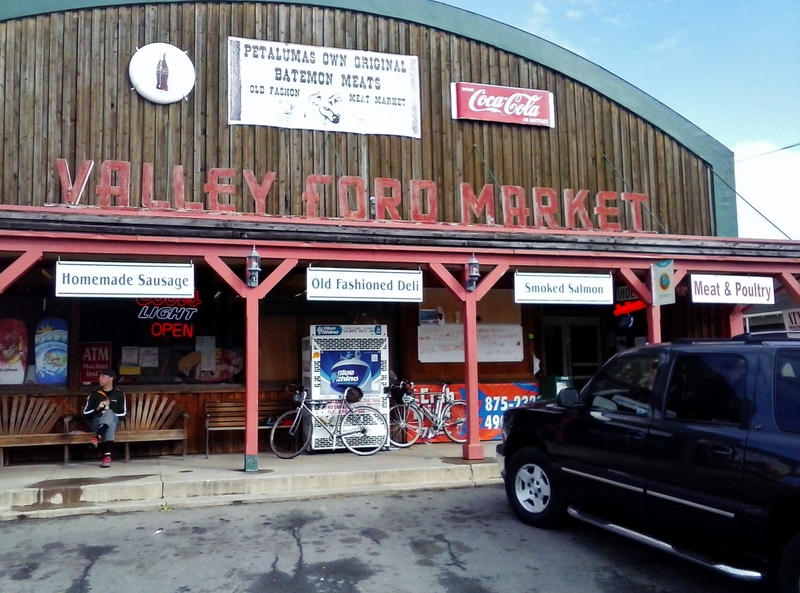 From Petaluma to Valley Ford, I was still mostly riding alone but with other randos typically in sight. It was getting even warmer out, and I didn’t have room to stash any more layers, so I rolled up my sleeves on the climbs. I took an extended break at the second control when a few more familiar faces rolled in, and I would roll out with this small pack including Eric, Metin, and Roy. They were the right pace for me, and great for conversation too. I recall the point where we returned to familiar roads, as this time there was more wind, and a lot of tree debris on the roads. This made it harder for cars to pass along Tomales Bay, where the road is already a bit winding, and we weren’t riding far to the side to avoid some of the sticks in the road. My typical rando-math skills yielded not-so-accurate estimations, as the final approach to the finish was slower than I remember. I was tired, hadn’t eaten or drank enough, and the terrain feels a bit tougher on the way home after 100 miles. My right knee was getting sore from frequent stop/starting in town too. We lost Eric to a flat close to the end, as he told us not to wait up. Three of us finished at 9:15hrs, which still brings down my average 200km pace, so I was very happy with that result. Big thanks to Metin for the carpool, and especially for showing me the best burritos in town on the way home. Update: I’m now in the San Francisco area. Previously I was near Los Angeles, Seattle, and Ithaca, NY. It’s certainly nice to have weather in my favor for riding 200k this early in the year! I had only gotten out for a few 20-45mi rides after moving to San Mateo, so I knew the first brevet was going to be difficult. It was great to show up at the start and see ~130 riders though. 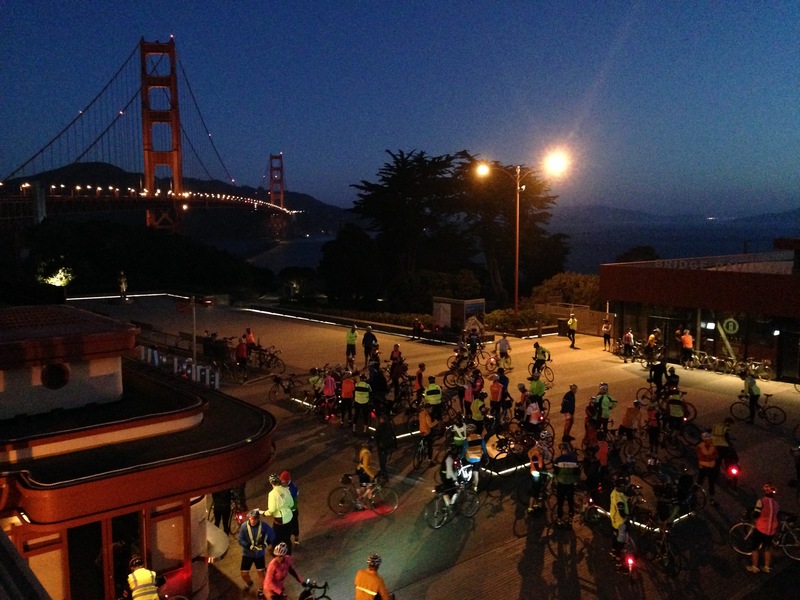 The rides start by crossing the Golden Gate Bridge. It’s an experience, but I’d struggle to call it anything more than that. With bumps all over the place and obstacles along the sides, it requires paying close attention, so it’s hard to appreciate the views. At least in the morning there are no tourists out yet. 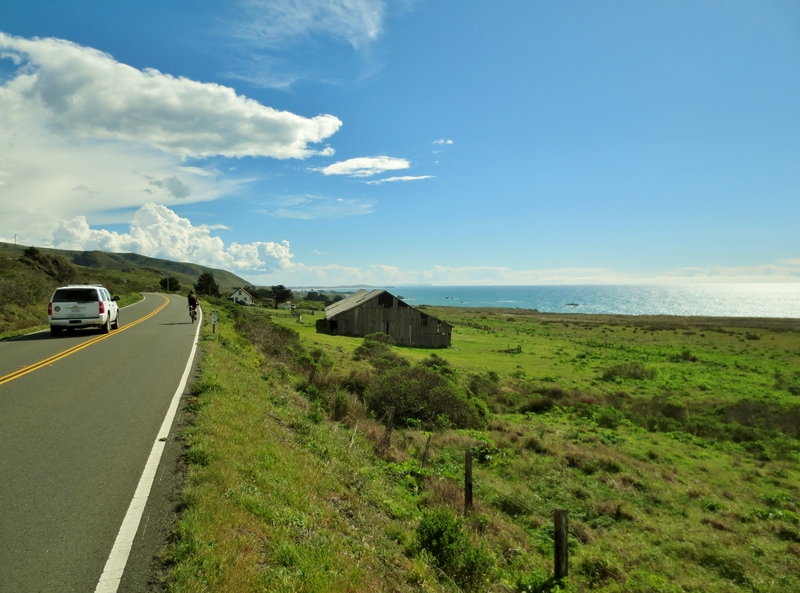 The Pierce Point route follows scenic roads along both sides of Tomales Bay. First on the west side, with a good amount of terrain, especially with the final hill before dipping down to the out-and-back control. There were signs for beach access trails, and I hope to come back sometime to hike here. The east side had a little more traffic, but was still a great bay view, with the smell of seafood in the air. I was able to ride along with a few people, but there didn’t seem to be much of a group anywhere, except for the fastest guys in the front that I would see on the out-and-back controles. Apparently the Golden Gate Bridge also contributes to this, because it strings out all of the riders in the first few miles. I had a good fight with diabetes all day, since this was the first big activity since before the holidays. 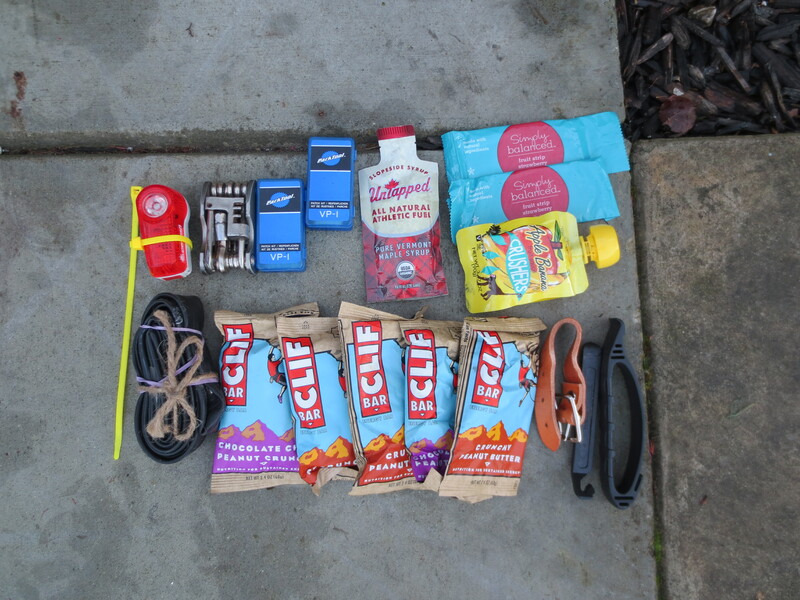 I had eaten many Clif Bars, and was getting sick of them. At 90 miles in, I just sat by the side of the road to try to get more food in. I started to ride again, and was feeling better. Somewhere after this point, I met another rando and we rode together to the end, with a time of 8:57hrs. It’s tough to stretch from 45 mile rides to 200km this early in the season, but with open roads and good weather, it’s tougher to pass up a ride like this! I didn’t blog much over the past few months. It’s not that I wasn’t ridding, it’s just that I never seemed to find my kind of rides in time. The difficulty with this plan to frequently move is that it takes me about as long just to hear about the kind of rides I’d love to be on. LA also seemed to have relatively few adventurous riders and no real sense of randonneuring. That’s not to say that I wasn’t riding though. I seemed to literally make a circle with my routes. 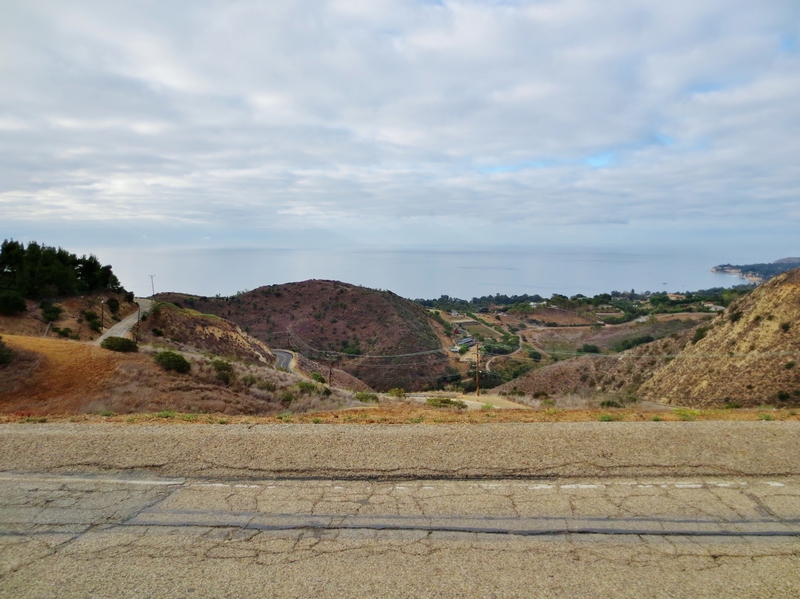 In the beginning, I was riding to the northwest in the Santa Monica mountains. This is excellent grounds for climbs, with very little traffic. My favorite ride here was the Gran Fondo, culminating with a climb on Piuma. 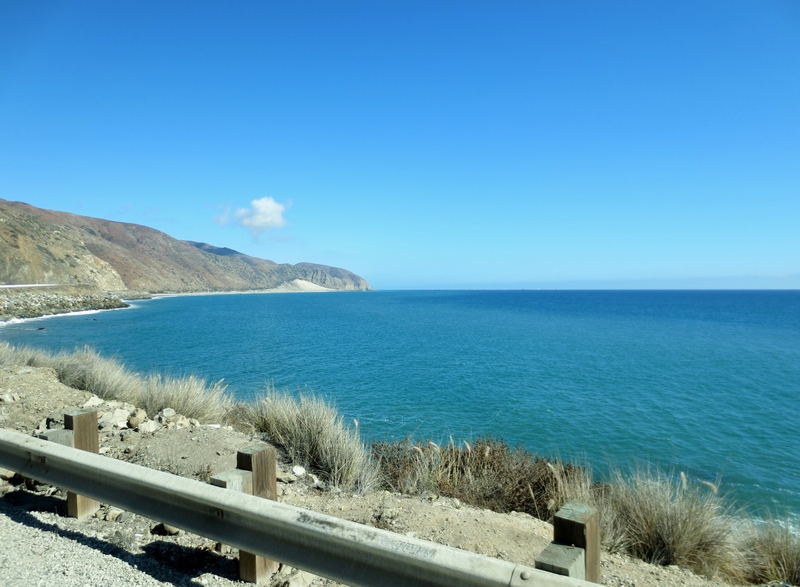 Another good one was Tuna Canyon – a one-way descent through a twisty canyon that feels extremely isolated, yet is literally connected to the infamous Pacific Coast Highway. Then I meandered more north to the canyons above Beverly Hills, Bel Air, and Hollywood. These were close by, and although they had more traffic, they were fun to ride and still difficult climbs all around. I even did a midnight ride here with a group, overlooking the cityscape of lights. I moved onto the northeast, aiming for group rides out of Pasadena headed east under the big hills. It’s 20-25 miles away, but this was the only place I could find group rides that weren’t simply up-n-down the coast highway. After riding to a group ride with no group showing up, I ran into Will, who was also into adventurous riding, as he led me through a mountain bike area, and told me about a big fast group ride I would later come back for. We also rode together to Santa Barbara, which was my last long ride in the area. To cap off my circle, my final rides were to the southeast. 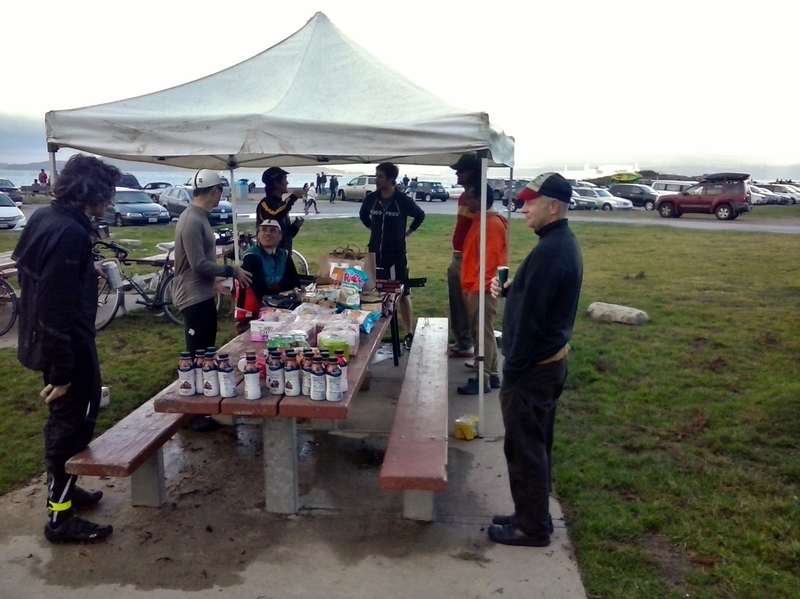 This was the first I heard of #CoffeeOutside, where serious cyclists converge for a very serious coffee drinking party. 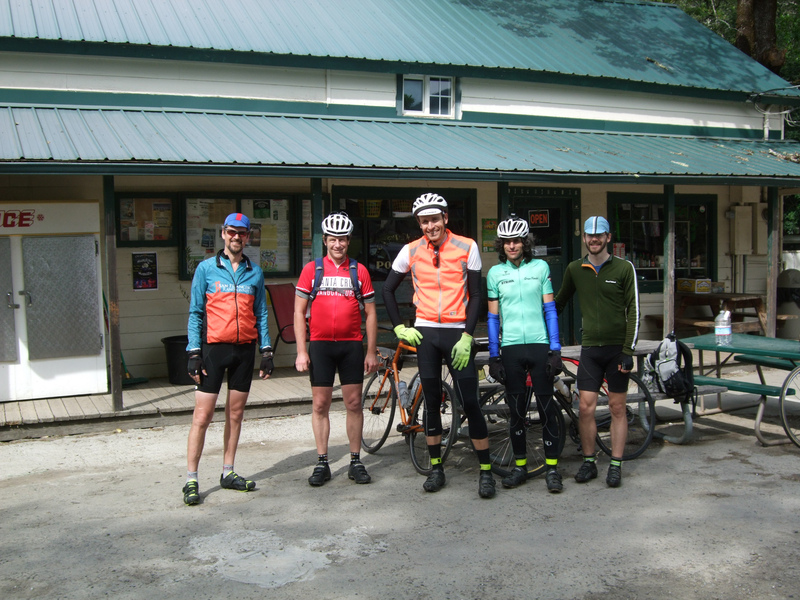 It wasn’t far, it wasn’t intense ride, but it was a great way to spend a morning with a good group, while we made coffee over camp stoves. More on that to come later. In a nutshell, I think I now understand the hashtag #LASucksForCycling. 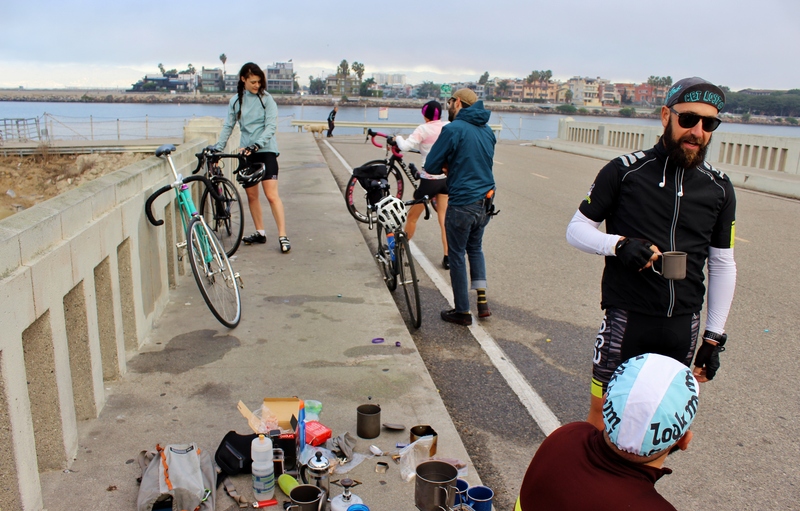 There are great opportunities for all sorts of rides, but in order to get to them, you just might need to ride through 25 miles of city, or 25 miles of parked cars on the PCH. And other than some racing groups and some very late night somewhat questionable groups, it’s tough to find others just looking for an adventure. I’m sure more of it exists, but I didn’t find it in time. At least the weather is always perfect. 04/19/2019 Portsmouth, NH - pizza and beer you say? Adventures in life and along the trail.